Only now it is possible to obtain a shining limited body set! 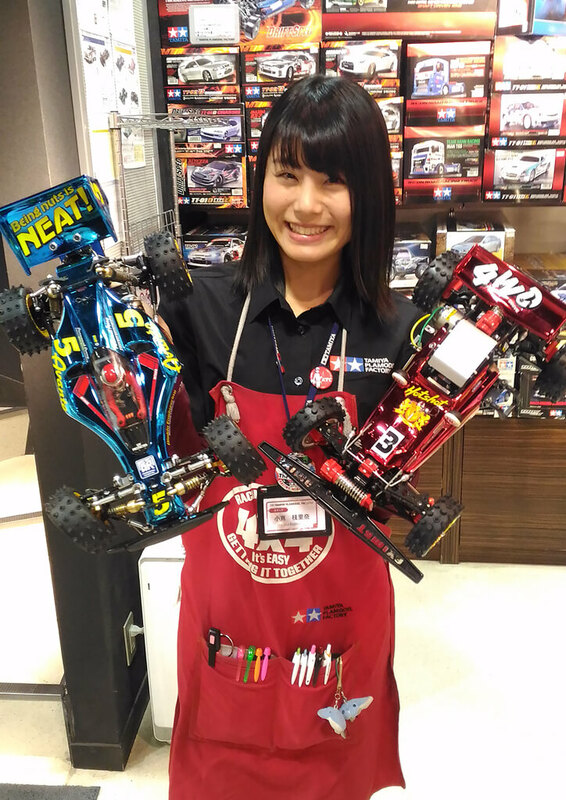 “Hot Shot Red Metallic & Avante Blue Metallic Body Set” on sale now on sale on September 30, 2018 (Sunday, September 30, 2018) soon will reach the prescribed number as it is on sale as a magazine limited mail order item of “Tamiya RC Perfect Guide 2018” The order was closed due to it. 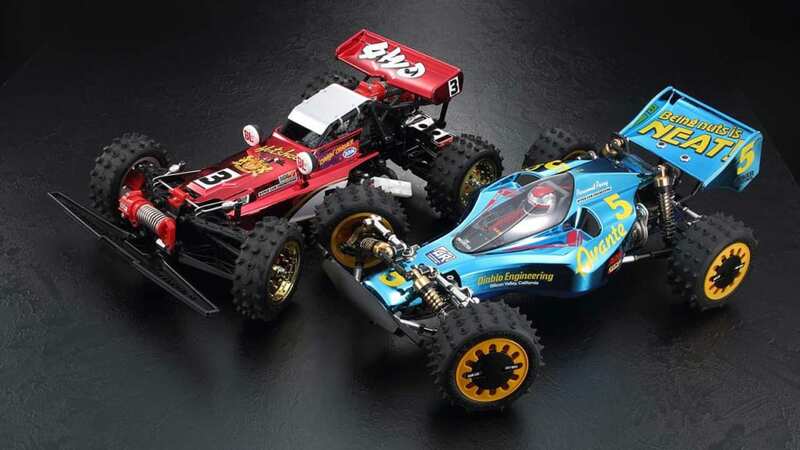 This product was prepared as a magazine limited item of the official guide book “Tamiya RC Perfect Guide 2018” that covers the currently available Tamiya RC (radio control) model, and currently Tamiya lineup as a reprint model 4WD Buggy It is a set of spare body parts that are attached to old cars “Hot Shot” and “Avante”. 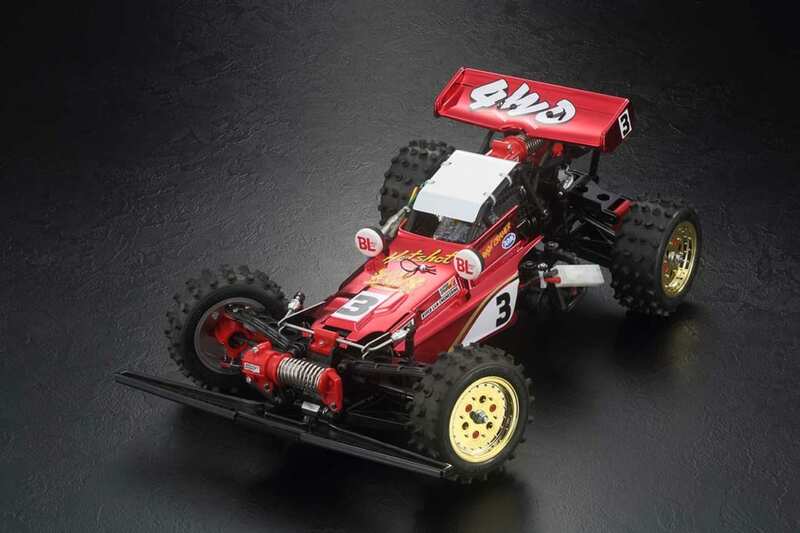 Hot shot was a buggy model equipped with Tamiya ‘s first 4 WD = 4 wheel drive system released in 1985. A full-fledged mechanism such as the suspension of four wheel double wishbone equipped with front and rear monocoque is given to the monocoque frame made of ABS, and the differential gear is built in the drive system of the shaft drive full time 4WD. A number of advanced mechanisms and stylish forms were longing for boys of those days. 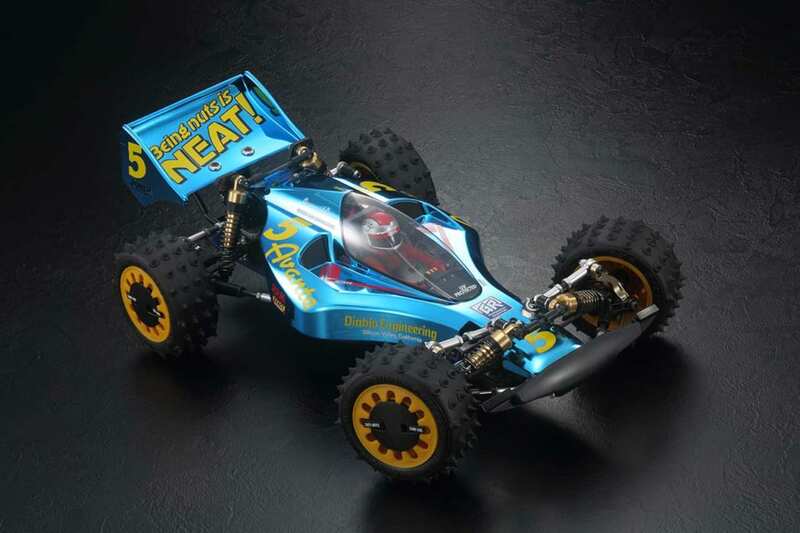 Avante who appeared in 1988 is a pure racing model in which all of Tamiya’s technologies at the time were poured. The planetary type ultra-compact differential is mounted on the innovative shaft 4WD drive system which laid out a vertical power motor “Techni gold” in FRP double deck frame vertically, achieving both high driving efficiency and smooth cornering. A wide range of settings was made possible by adopting aluminum front and rear oil dampers and adjustable type undercarriage that can correspond to every road surface, and it made a good result in the many races held at that time. 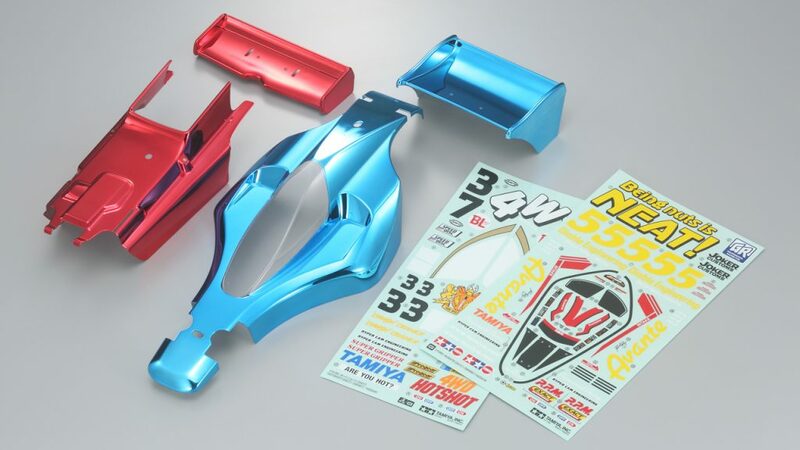 The body set that can be attached to these two legendary famous cars has been painted with metallic colors of red (hot shot) and blue (avante) which are the image colors of each of them. Its beauty is its beauty that can not be expressed with ordinary painting, and it is offered as cut so that neither scratch is attached at the time of assembly. Easy to complete by just sticking the included sticker is also attractive. As mentioned above, the opportunity that this limited body can be obtained is until September 30, 2018 (Sun) ! 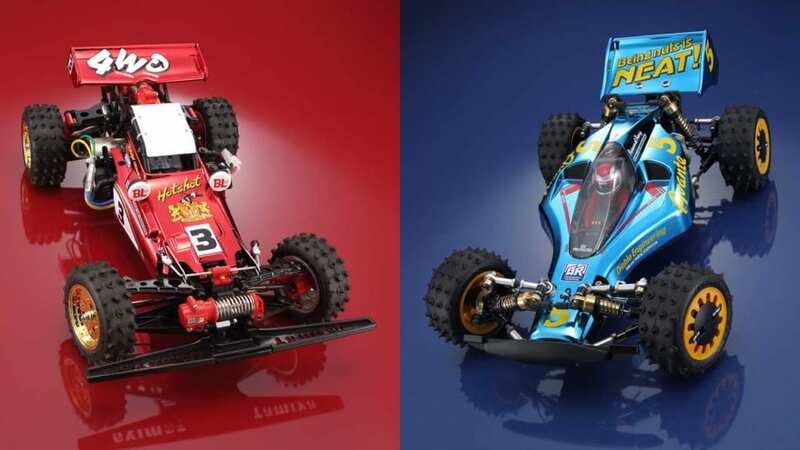 If you are a fan of Tamiya RC cars, please purchase the limited body you would like to purchase on the limited special site posted on “Tamiya RC Perfect Guide 2018” (page 161)! ※ The set of photos will be the item to deliver (Set Contents Hot Shot · Body & Wing × 1, Sticker × 1 / Avante · Body & Wing × 1, Sticker × 1). This entry was posted in Customized Builds, Future Releases on September 25, 2018 by admin.